We'd dealt with snow flurries on the 200K, sleet on the 300K, and an all-day cold rain on the 600K. It was about time for some warm weather and sunshine, and that's just what we got this weekend for a 400K ride to complete my second Super Randonneur series! A good sized field lining up for the start. Including myself I count 34 folks in this group. There were a couple up the road and some folks off the back, but this was the main peloton. At one point during the early miles- I think it might have been Milk Dairy Rd.- we made a turn onto a really rough stretch of pavement. The vibrations were really giving all the bikes a good shakedown, making sure everyone's accessories were firmly attached. Someone near the front lost a blinkie light, which shattered into many sharp plastic shards on the road and everyone tried hard to avoid it. I was in mid-sentence talking to Tim when his cue sheet jumped ship and he pulled out of line to retrieve it. I also saw Geof pull off to the right, but I wasn't sure why. Turns out he had run over the plastic shards and sliced his rear tire. The thought of stopping with Geof crossed my mind, but I figured he and Tim would catch up quickly and I wasn't sure I'd be able to hang onto their wheels if I stopped with them, so I just stuck with the group. Unfortunately they had longer stops than I had guessed, and I wouldn't see Tim and Geof again until the 300K point back in Lumberton! At the first controle in Wagram it became clear that this was not going to be one of those relaxed brevets like we'd been having in the recent cold winter weather. The combination of sun, warmth, and a large group meant the short-stop controle competition was ON. I flipped my cue sheet, got my card signed, and downed a fizzy caffeine drink and saw most of the 400K folks I knew rolling on down the road. I had chugged the drink a bit too fast, but had to get going and catch them anyway. It kept getting warmer and they kept getting faster, but I was feeling ok and not having too much trouble keeping up. County line sprints were being contested, which also served to whip the pace up from time to time. This route has a bit more rolling terrain than the routes we'd been riding south of Lumberton on the previous two brevets, so mainly I was having trouble with the speed was on the uphills. At one point I was second in line when we hit a small climb and I just couldn't hold the wheel of the guy on the front, so I had to pull off. I felt bad about shirking my turn in the wind, so once the road leveled out I went back up to the front to put in a bit of a token effort to make up for it. At the second controle in Ellerbe there was once again the mad dash competition to be the first in line to get the cards signed. I had a hard time even finding a place to park the bike- sorry Joel for snagging your spot! I ran through my to-do list quickly once again: cue sheet flipped, card signed, fluids topped off, and I removed my vest and warmers. This time I was ready to go before the rest of the group so I figured I'd roll on out and they'd catch me soon enough. I got my cadence up and found my rhythm, and soon I was felling really good. It's amazing the difference between trying to match someone else's pace and being able to just ride within my limits. I was slower on the uphills, and I'd see the group closing the gap up to me, but then at the tops of the hills I'd get my speed back up and pull away again. If I'd been at the back of the group I would probably have been dropped on the uphills and then pushed myself too hard afterward trying to bridge back up to the group. Eventually Jerry flew off the front and came up to tell me to slow down and ride with the group! I'm really starting to think that riding alone and within my limits is less tiring than killing myself in a fast group, even though I don't get the benefit of the draft. While I was still feeling good I jumped into a county line sprint and actually had the strength to pull ahead and win! The line was right at a rough bridge crossing, so I didn't dare give the ride-no-handed salute... crashing after winning a CL sprint makes you lose lots of cool points, and I don't have many to spare. Soon the rolling terrain and trying to keep up with the pack was taking it's toll on me, but just in time we came upon Tony parked along the roadside with cold drinks and Subway. 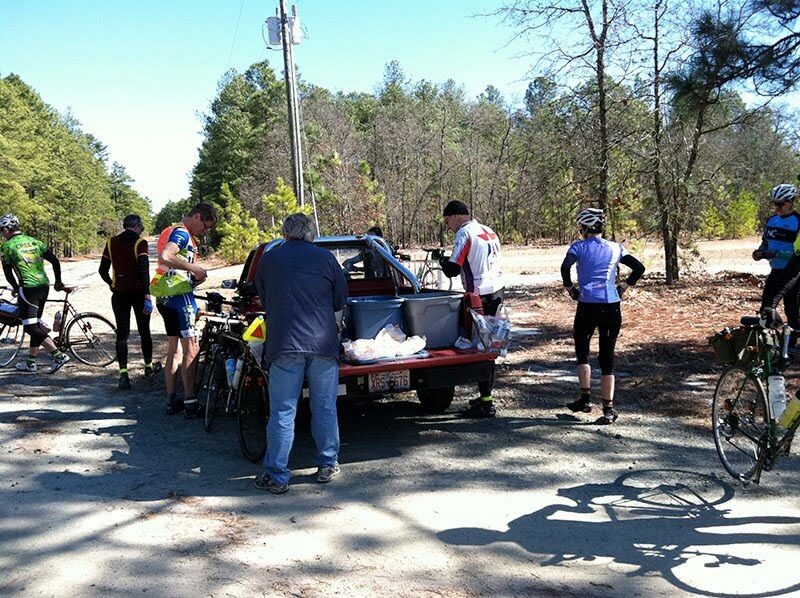 The food was just the ticket I needed, and I stuck with the others all the way through Pinehurst and Southern Pines- a beautiful scenic ride that we all enjoyed immensely. At about the 95 mile mark I got gapped off the back on an uphill and I just let them go. I had 20 miles to go till the next controle at Spring Lake and I knew that yo-yoing off the back would wear me out more than just spinning it out. I had a great tailwind the whole way through Ft. Bragg, riding through deserted pine forest all alone. When I got to Spring Lake John O. was still there, not wanting to try to stay with the group that had already left. I ran through my checklist quickly, but while my back was turned John and Joel took off! 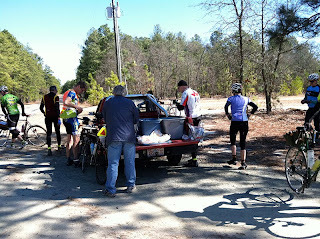 Tony set up a lunch rest stop for us on route! I decided to go catch them, and lucky for me they weren't in hammer mode. When I got them in sight I could tell they were just spinning along, riding side-by-side and chatting almost as if they were waiting for me. We rode together for quite awhile, but eventually I just had to ride my own pace. John stuck with me and we rolled into the Erwin controle together. 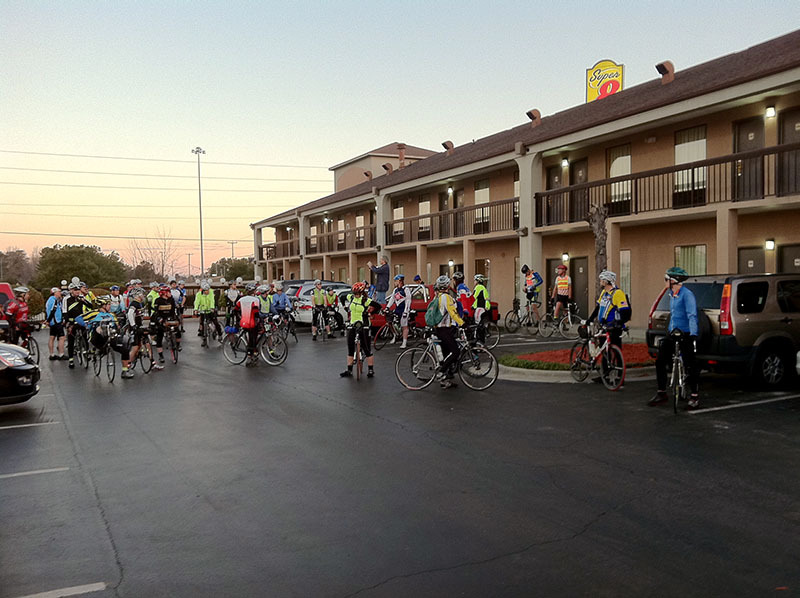 We had a nice relaxing stop, and I went ahead and put on my reflective sash and put my arm warmers back on to prepare for the darkness that would descend during the next 58 mile stretch back to Lumberton. John was great about sticking with me, even though I was slowing him down. Just outside of Fayetteville we were caught by a group of three and we tagged along with them for a bit. There was a turn off of Middle Rd. onto Dunn Rd, and for some reason we all misread the cue sheet and thought we were entering the town of Dunn, NC. At a crossroads we spotted a Baldino's Subs and John and I decided to stop while the rest went on ahead. 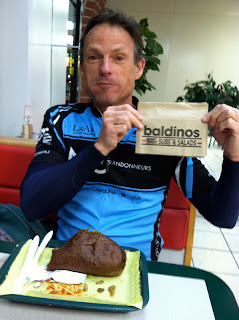 One day I'll have to try a Baldino's sub again to see if they really taste as good as this one did after 165 miles on the bike! While we were stopped I put my leg warmers back on and put fresh batteries in my headlamp. I also texted Geof to tell him we were in Dunn! We wondered why there were officers from the Fayetteville Police Dept. having dinner at the sub shop in Dunn, but we still didn't put 2 and 2 together. John enjoys one of the best subs ever made. When we were getting ready to roll we spotted a couple of riders who were lost, having turned back after going into downtown Fayetteville and not finding the next left turn on Franklin St. They took off before we were ready to follow, but once we were back on the road we discovered what they were talking about. We missed Franklin St. and took a little tour of downtown Fayetteville before finally backtracking and finding the route again. Luckily the delays had worked to our advantage and a group of 3 riders including Ian H. caught up to us at a stoplight. The five of us stayed together all the way to Lumberton, trading off turns at the front and adjusting our speed so no one was getting left behind. It's always nice to stick together after dark. This was my second long ride with the new headlight and once again I was very impressed. The B+M IQ CYO N light is very bright and it's beam is nice and even. In our party of 5 I had the brightest light. I don't notice any drag from the Shimano dyno-hub even though I know there is a small amount. The only problem is that now I'm the one blasting others from behind, casting long shadows on the road in front of them. It makes them want to stick me on the front in the wind! Back in Lumberton we had 300K done. Tony had pizza and cold drinks waiting for us at the Super 8 and we stopped for a rest. Ian had a shower and got in bed, needing to get some sleep before heading out again on the 1000K. I started getting cryptic texts from Geof, who I hadn't seen since his puncture in the early morning. He said "6 miles away" but my last text to him said we were in Dunn (Fayetteville!) so I didn't know if he meant 6 miles from there or what. I texted him "we're in Lumberton" and he replied "3pm." Now you have to understand that it was 9:30pm and after nearly 200 miles in the saddle your mind just doesn't work right. Anyway, Geof's texts made no sense to me so I texted him "pink fluffy bunny slippers" and he didn't reply. Turns out he had meant 3mi, not 3pm so he was just 3 miles from Lumberton. He and Tim had skipped dinner and ridden straight through. They were ready for a long stop and some pizza. John was ready to get going, and I wanted to go too, but I also wanted to ride with Geof and Tim so I waited. While I was having another slice I overheard rider named Mike having a somber conversation with Tony, it sounded like he was thinking of abandoning. I heard Tony advising him to take a break and ice his knee- plenty of time left so no need to make a hasty decision. A little while later I asked him which ride he was doing and he told me the 400K. I too suffer from knee pain when I push too hard on these long rides, so I suggested that we ride together and spin easy gears for the last 100K. I thought that Geof and Tim might go faster than I wanted to and that it would be nice to have some company on the dark roads in the wee hours of the morning. That turned out to be another one of those great rando decisions- Col. Mike is excellent company on the road, and he was telling me about his job at the Pentagon and describing the intricacies of the Russian language to me! Too bad my mind wasn't working better or I might have been able to retain some of that knowledge. Geof and Tim didn't stage a breakaway, so we four stayed together for the whole last 100K to Clarkton and back. As we rode down Hwy 211 we passed a mobile home with 6 or 8 dogs in plastic pet carriers and cages out in the yard- gotta love North Carolina. This was just after Midnight and the residents were out in the yard drinking. The dogs got all riled up and barking and that got the rednecks all riled up and barking, and next thing you know they ran out into the road behind us yelling and screaming "don't come back here again" and whatnot. Of course this was on the way out to Clarkton, so we had to come back that way in about 20 miles or so! We tried to warn other riders as we saw them on their way back, but I'm not sure if others had the same experience we did or not. When we arrived in Clarkton there were 2 convenience stores and there was some confusion about which was supposed to be the controle. One store had a police car with it's blue lights on in the parking lot, so when the question "which store?" came up the quick answer was "how 'bout the one that's NOT getting robbed??" Of course, that turned out to be the only one that was open. I had a coffee and sat down on the curb, the cold concrete actually felt good since by now my saddle and I were no longer on speaking terms. The weather had turned a good bit colder than predicted, and I was not the only one who was wishing they'd brought more layers. I'd brought the windvest but left the sleeves, and I could've used my glove liners to add to the DeFeet gloves, but other than that I was doing ok. We rolled on for the last 30 miles of the ride, past the rednecks, who yelled at us again. The one consolation was that at least they were drinking at home and not out driving around with us. We saw other riders on their way out as we were headed back in, some were 400K'ers who had taken a nap, some were 600K'ers, and then when we were almost back we saw Ian on his way out on the next leg of his 1000K journey. We rolled into the Super 8 at almost 3:30am cold, tired, and hungry and Tony had more pizza. I congratulated Tim- he and I both completed our Super Randonneur series with this ride. It felt good to be done, and great to get back into street clothes. Geof and I went to the Waffle House for some food and some much needed coffee before getting on the road. It was a great ride! Still in awe of all you guys finishing your SR this early in the year. Fantastic. I like the Garmin-trace ... particularly that "jump" from Lumberton to SE of Raleigh. I suspect that Ricochet may be contacting you regarding getting enough battery life to last for 400k.